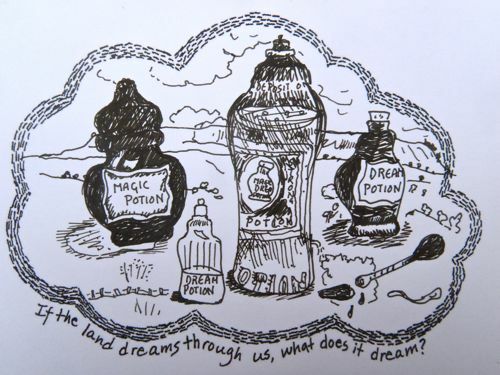 We know we’re not the first to invent the idea of a dreaming potion……how could we be? Well its hardly an original idea is it? People have been dreaming for donkey’s years, people have been wanting to tamper with dreams since time. There are always going to be those who want to dream differently themselves or affect the dreams of other Humans, Animals and Things. The complete requirement for DREAMING POTIONS through history and prehistory, must have been immense. Rather than buckets full of potions it is more appropriate to talk of A SEA OF POTIONS. There have been just so, so many humans, pre-humans and proto-humans, dreamers all, some of whom at some point will have wanted to change the quality, quantity, content of their own dreams or dreams of others. That’s so many dreamers wanting a potion to enhance their dreams. – A potion has been sought to DREAM MORE INTENSELY, DREAM BETTER, DREAM CHILDREN, DREAM DIFFERENTLY, DREAM FOR OTHERS, DREAM FATTER, DREAM FASTER, DREAM THE FUTURE, DREAM WILDER, DREAM IN TECHNICOLOUR, DREAM LESS. DREAM SOLUTIONS TO PROBLEMS, DREAM WHERE TO GO NEXT, DREAM BACKWARDS, DREAM THE ANCESTORS, DREAM PLACE, DREAM PROSPERITY, DREAM DREAMS, DREAM WHERE THEY LEFT SOMETHING, DREAM THE NEXT MEAL or maybe just DREAM MORE full stop. Thats soooo many off the shelf and bespoke DREAMING POTIONS for the many varieties and classes of DREAMERS with their many and distinct DREAM REQUIREMENTS. It seems impossible to even begin to think about them all. But we can at least begin. I have heard that marmite is a good dream potentiser and it has worked for me. A bit of toast and marmite at bed time. To take a tiny whiff from a small selection of the probable potions is to be assaulted by the heavy stink of crushed, pounded, squeezed melted, seeds, plants juices, minerals, extracts, organisms, fermentations, secretions, oils and incantations. 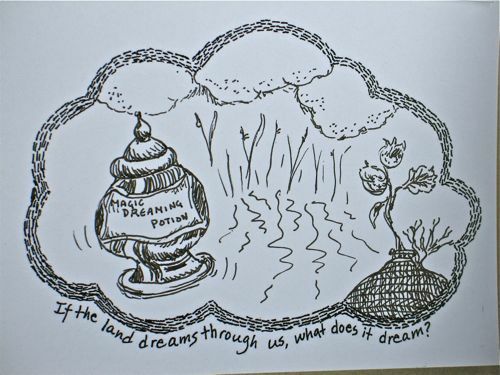 These potential DREAMING POTIONS are so powerful, so intoxicating, so overpowering as to render even a sturdy dreamer completely and utterly DREAMLESS. 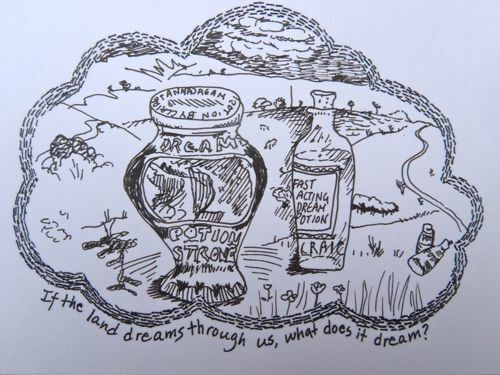 We can’t document even a tiny proportion of all potions designed to affect DREAMING. It just can’t be done. Its too tedious, scary, mad….. to do in a lifetime. 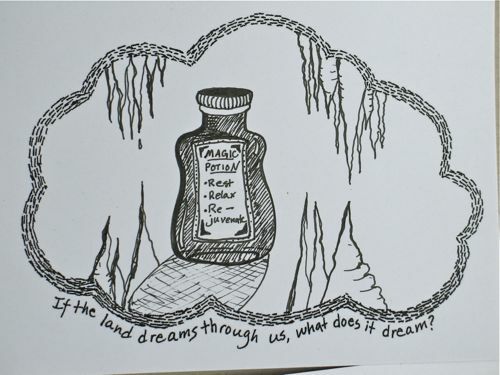 So though we won’t document Marble Arch Caves Gopeark dream potions we will make a LIST OF SOME DREAM POTION CONSIDERATIONS and we will think about making our own. If you intend making your own DREAM POTIONS you might like to consider the following. Ingredients, quantities, smell, taste, consistency, toxicity, addictiveness,storage, availability of ingredients, appearance, know how, price, method of mixing, sell by date, potency, distribution, functionality, container, recipient, exlusivity, time taken to make, legality, time to repose, quantity to take, effectiveness, dilution, mixing bowls, social stigma, side-effects, availability to the consumer, secretivity, desirability……. gloopiness. How have all the potions that have ever been shaken, stirred, sampled, gifted, smuggled, tasted within the lands of what is today Marble Arch Caves Geopark changed the pattern, shape and texture and history of the landscape of dreams?